Home Mobile Applications The best Android games that don’t require WiFi! A lot of Android games depend on a mobile data connection. Whether it’s downloading stuff from the server like Clash of Clans, or using it for DRM protection like most Final Fantasy games, it seems like virtually every game is asking you to be within close proximity of a web connection just to make the game run. Not everyone has that luxury so here are ten of the best offline Android games that don’t require WiFi at all. If none of these are floating your boat, Google Play has a list for offline games for your convenience. Those include some modern games like Subway Surfers and classics like Fruit Ninja. Here are some of the best Android games that don’t require WiFi or a mobile data connection! Beamdog is a developer on Google Play. They have four offline Android games in total. They include Baldur’s Gate I and II, Icewind Dale, and Planescape: Torment. They’re ports from popular PC RPGs from the early 2000’s. All four games are gigantic, complex, and long. They easily run 30-40 hours at least. The controls are a bit complex unless you have a large screen like a phablet or tablet. They’re a bit expensive. However, you get the full game for one price. The in-app purchases are for extra things like voice packs. Crashlands is among the best offline Android games ever. You end up on a planet with no way off. The goal is to build a base, defeat the main bad guy, and craft various items to get out. It comes with a simple, fun combat system. There is also a self-managing inventory, tons of stuff to craft, and tongue-in-cheek humor that keeps the atmosphere light and goofy. There is also cloud saving support, offline play, and controller support. It’s $4.99 with no in-app purchases. Crossy Road is one of the most popular mobile games. It’s basically the Frogger of the mobile gaming generation. You guide a chicken across the road, streams, and around various obstacles. The game features over 150 collectible characters, local and online multiplayer (when you play online anyway), offline support, Android TV support, and more. It’s a family friendly game that is free to play. The in-app purchases are mostly for cosmetic stuff that doesn’t affect the game. Square Enix bounces back and forth when it comes to the severity of their DRM protection. Some Final Fantasy games require an online check every time you open the game. Others don’t. Final Fantasy IV in particular is even listed on Google’s offline Android games list. All of the games are 20-30 hours long with deep story lines, excellent soundtracks, and simple enough mechanics. A few of the games are playable offline. However, you may need to occasionally open the app with a web connection to get the DRM check. You may need to check before the refund time expires. They are a tad expensive, though. Square Enix has a series of GO games themed around Hitman, Tomb Raider, and Deus Ex. They’re puzzle games where you move around a game board to try to make it to the other side. Each game has obstacles that are themed by the various games they come from. For instance, Lara Croft Go has you dodging snakes, exploring ruins, and finding hidden clay pots. They’re $4.99 each. Hints are available as in-app purchases. They aren’t necessary, though. They are also on sale fairly often. The Lifeline series is a new spin on an old classic. They’re text games. You usually play as an operator. The player ends up the only communication with someone in dire circumstances. Your make decisions on what that person does. They live if you succeed and die if you don’t. They’re simple games. They also work on Android Wear. You can even play the game from your notifications on certain titles. They’re relatively inexpensive with no in-app purchases. 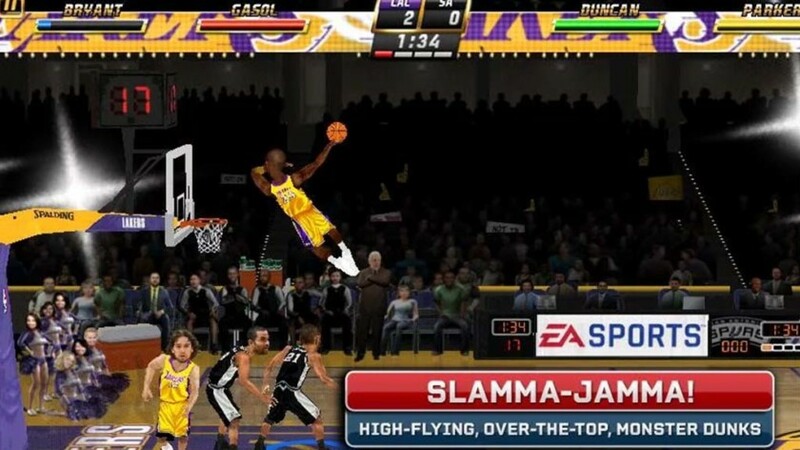 NBA Jam is probably the best arcade sports game right now. It features two-on-two basketball. The rules are rather relaxed as well. The team with the most points at the end of the game wins. It features local and online multiplayer, controller support, and more. The game also has a campaign mode to play through. It even has Android TV support. There is a lot here for $4.99. It also has no in-app purchases. Minecraft may not have story lines, but if you want the biggest bang for your buck then it’s probably this game. You can create whole worlds and play in them offline either in creative mode or survival where you can build stuff, mine stuff, kill bad guys, and do pretty much whatever you want. It’s not as big and immersive as the computer version but the developers have been closing the gap by adding things like Redstone for more unique building. It’s $6.99 with in-app purchases. The extra purchases are for player skins. Those who like the idea of Minecraft, but want a different experience, Terraria is also an offline game with similar mechanics. Quizoid is a simple quiz game that asks you questions that you attempt to answer. It boasts over 7,000 questions across several levels. They developers plan on adding more. It also has over a dozen categories, three game modes, and various in-game hints to help you figure out the answer. As its mention on this list implies, you can also play it totally offline. You can grab an extra 3,000 questions along with some other perks if you pick up the pro version of the game. It’s one of the better offline Android games for quiz fans. Prune is a fairly . Each level features a plan that grows. You trim the plant so it grows into the sunlight. The game features 48 levels, minimalistic graphics, and easy game play. It’s definitely a more relaxing title. It’s possible to finish levels with more than one solution as well. Thus, there’s no pressure to do it a certain way. The game is $3.99. It has no in-app purchases or advertisements to get in the way. We have some more shamelessly promoted Android game lists for you! Reigns is a franchise of simple card games. You play as a ruler and you get cards. Each card gives you an option. You swipe left to agree or swipe right to disagree. The decision you make either gets you to the next stage or kills you and ends your reign. The second game has more options and more stuff to do than the first game, but they both play basically the same way. They’re also both relatively inexpensive and have no additional in-app purchases. Of course, they’re also playable offline. Rollercoaster Tycoon Classic is a port of a popular PC simulation game. Your goal is building a popular, profitable theme park. You can custom build coasters with a variety of types. The game features various parks and scenarios. You win the level if you fulfill the requirements. There is also DLC that extends the campaign. It also includes a build-your-own-scenario to extend the game indefinitely. This is among the best simulation games on mobile, period. It’s also among the best offline Android games. Smash Hit and PinOut are two of the better infinite runners. Smash Hit is played in first person. You throw balls at panes of glass to avoid injury. The number of balls also represents your life total. PinOut is a new spin on pinball. You must keep the ball flying for as long as possible. Both games have free and paid versions with no additional in-app purchases. That makes them rarities in the infinite runner space. That’s not a bad one-two punch for offline Android games. The Room 3 is the latest iteration from The Room franchise and it’s the best one yet. It has crisp, gorgeous graphics, unique puzzles, and new elements added to help you solve puzzles that weren’t present in older games. The game is a bit short, but this time around the developers have added things like alternate endings which add replay value to make the game longer than prior titles. It also doesn’t have any in-app purchases, supports Google Play Games features (cloud saving and achievements). Do be warned, though, that offline players won’t be able to use the Google Play features. The first two The Room games are also excellent offline Android games. XCOM: Enemy Within is a tactical strategy game where you must move around the map taking down aliens that are trying to kill you. The graphics are really good and the game play is easy to learn. The game itself is rather difficult and should provide a decent challenge in order to complete the whole thing. You’ll also get to research alien tech in order to make yourself stronger and you can upgrade and recruit new team members as well. There is also multiplayer for when you get a web connection again. There are no in-app purchases with XCOM. If we missed any of the best offline Android games, tell us about them in the comments. Or visit our sister site AndroidApps.com for more Android games that don’t need wifi. Previous articleAre Front-end Frameworks Solutions or Bloated Problems?